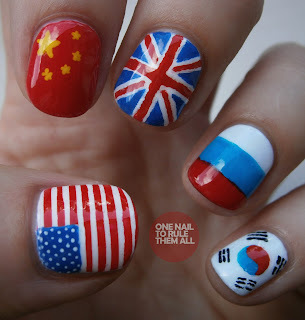 I must say that the olympics have made me very proud to be British and I was definitely supporting Team GB the whole time, so when we placed 3rd in the medal table (which, when you think about how small we are, is quite a feat) I knew I wanted to do flag nails related to the olympics. Our flag takes pride of place on my middle finger (don't look too much into that) and in order of the top 5 from thumb to middle finger is the American flag, the Chinese flag, our flag, Russia's flag and the Republic of Korea's flag. The base to all nails was Barry M - Matt White and I also used Barry M for the red and blue and acrylic paint for the yellow and black. All details were done with a small brush. Hope you like them! There's only one picture today because it seemed a bit silly (and offensive) to cut off the American flag on my thumb as I usually do. Great idea for this day's challenge, I wouldn't have a clue what to do for "inspired by a flag" !